After a few experiments, I’m pleased with this result. 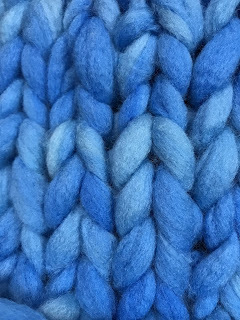 I’ve seen examples of jumbo knitting which had perfectly uniform color and stitch. If I’m going to make my own, it’ll be truly mine with creative variation and a unique quality. Where did "martaschmarta" come from? Back to school today. I feel like I'm actually going towards joy, instead of leaving it behind when break is over. I love my day job. It struck me just how much when I chatted with a student who works at the sandwich shop where I bought lunch yesterday. I left smiling and kept on smiling all afternoon. I'm shipping off some pretty exciting stuff today. More on that at a later date! It's a week away from hexter 6 and I'm not done. It's garter stitch, yea, that's right, that's why it isn't done yet. That's my story and I'm sticking to it. With a big project midstream, I haven't been spinning. I'll be glad to get back to it soon. Everyone has an opinion on Marie Kondo's method of Tidying. I like a lot of it. Some aspects are definitely not for me. As a frugal person, the question that came to my mind was always, "Could it be useful...someday?" It's been very helpful to go through things and ask, "Does it spark joy?" Many times it's been "no" then it goes away after serving a purpose for me. This question is also helpful when I'm making purchases. It's not enough to just be a super deal that I could probably use...someday. Now, my purchases need to spark joy and be something for now. The result has been that one daughter got never worn shoes she needed and another daughter got yarn she needed...both now. There's also quite a bit that will go into the trash as worn out, and more that will go to a donation site. Now, if I could only get my husband to do this. He just puts things down, wherever - papers, empty boxes, tools (MY tools! ), anything.